US 2006-11-21 600 points ? 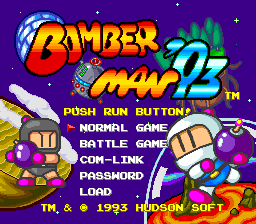 Bomberman '93 (ボンバーマン'93) is a puzzle game developed by Hudson Soft for the PC Engine and TurboGrafx-16 as part of the Bomberman series. It was also released on the Wii Virtual Console. Main article: Bomberman '93/Magazine articles. This page was last modified on 23 December 2018, at 05:48.